This really gave me exactly what I needed! This comics deserved to be implemented with some game physics. It is now done! Congratulation. It was fun! This is a pretty amusing game. Interprets the comic quite well, and the ways to control the elevator are fun to see, even if there aren't too many. 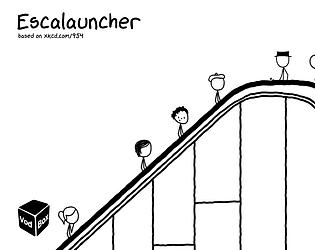 The sound effects are well chosen and well-implemented, and the graphics are simple but nice, xkcd-styled images. 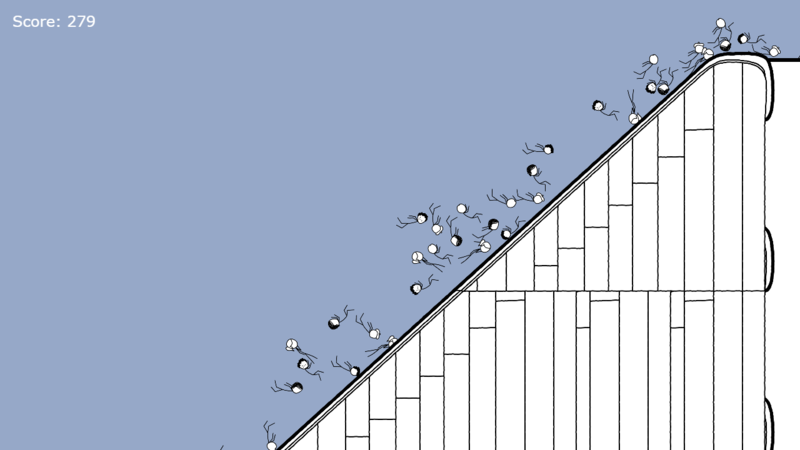 I do wish there were more settings/ways to cause chaos--maybe a mall shopper is holding bags or food, and you get points depending on how far it's flung, whether their items hit other people, etc. For now all you can do is control the speed of the elevator. Wonderfully evil. Absolutely love it. That was funny. The sound effects are A+. Not too violent but comedic enough AND THE TRASHCAN CRASH SOUND. Hilarious stuff! Feels good to be bad. I wanted to play this one after I saw it in the discord chat. It did not disappoint. Since the score is linked to the height someone gets above the escalator, it might be good to move the camera up a bit to show the characters moving a lot higher than the escalator.